Discussion in 'Touring Northern Thailand - Trip Reports Forum' started by DavidFL, Feb 1, 2006. Just back from a couple of nights in Chiang Khong (& the Madam Pub). In Chiang Khong the big flash new Nam Khong Riverside Hotel has opened. Price range is 500-600-700 baht a night. But for me the rooms are a bit small & they've "missed the boat" with the beds facing parallel to the river (so you get to look at the wall & not the river). Then a small high window does not allow you any river view even whilst laying down in bed. Unbelievable. So for me it is still bunglaow # 7 at Tamila for the greatest bungalow in North Thai / on the Mekong. Above: looking across the 'Khong towards Laos & Houei Xai. Above: The 'Khong upstream from Chiang Khong, en route to Chiang Saen. And David you forgot two other flash news bitts; the new stop light that was installed last month - we are now a one light town... And 7-11 opend the day after you left. We've not tried their coffee yet; the que is too long and besides, lost of great coffee to be found elsewhere in town. Spotted in Chiang Khong at the "Madam Country Pub & Restaurant" last Thursday night 25th January. The ol' Madam never ceases to amaze - not really much like a country Pub either! Bad news folks, for in Chiang Khong the Madame Country Pub has closed it's doors for good. Lek the owner has given up trying to run a night spot for the youth of CK.There's not enough of them. I had a few beers with Lek & the local constabularly last night & Lek says the kids of Ck now hang out at the 7-11 in Ck, such is the state of CK night life. Lek's going to open a new Pub & Restaurant at Ban Du 6 kms north of Chiang Rai & outside the Uni. Sounds like a good idea to me. The other good news in Ck now is that K Ekarin, ex 2nd in charge of CK immigration has finally been moved out (to police in Sukhothai.) Immig in CK should now be a lot friendler & perthaps even helpful. Just back in & hell it's been raining steady the last few days. Last night was the worst in Mae Sai, when the Ruak broke its banks, flooding both the border markets - in Tachilek & in Mae Sai...brief trip report coming. Meanwhile check out these few panorama snaps. Pic above: The Mekong at Mouang Kan, upstream from Chiang Khong. Pics above: Not The Mekong, but the Ruak flooding in Mae Sai. Back home at last after a few wet nights & days on the road. It was bright & sunny when I left Cnx but tropical storm Lekima seemed to blow right in as soon as I hit Chiang Rai. From then on the next few days were not very enjoyable at all. Just the previous week I'd been caught out in Chiang Rai, arriving in town at 6.00 pm for a torrential downpour to start at 7.00 pm & it was still raining heavily when I gOt up the next morning at 8.00am. So that was it - straight back to Chiang Mai. The happy go lucky girlfriend singer was impressed, but I wasn't, especially when it was a dry run home from Wiang Pa Pao - Chiang Mai = no rain at all! Now a week later the weather’s cleared up, the air is cooler coming from the North & I reckoned that yep it’s riding season here. The rain’s gone. So away with the Givi top box & on with the light Tourmaster travel bag. It was hot ‘n dry when I left town at 1.45 pm, but Lekima hit North Thailand that night it was wet yet again. Should have taken the Givi box to keep the clothes & computer dry! Fortunately it did not seem as bad as the rain in the lower North where severe flooding occurred in many places. Anyway after getting away from the super at 1.450 pm it was a dry run from Chiang Mai to Chiang Rai. I GPS-ed a few side roads in “Wiang Pa Pao city. There are a lot of Mickey Mouse sois there & I wonder if I will ever get ‘em all to put on a map. I also managed another nice little rural back road west of Mae Suai that runs out to the dam & loops back onto the Wawi Road & R118. If some of you riders have not been up R118 for a few months, then there are there are 2 sections of road works. One from the end of the 4-lane north of Doi Saket North & two from the Trekker House turn off to roughly Mae Kachan. The 2nd section by Mae Kachan is probably a bit longer than the Doi Saket one. Neither of these are any real problem, being only a few kms long, although the old asphalt can be a bit bumpy at times & is down to single lane in a couple of spots where they re road widening & cutting out small hills to lower the road. Once this is all finished the road’s going to be even better –wider, more undulating, smoother, more flowing = faster. Lovely stuff! I hit Chiang Rai on time at 4.30 pm, just right for a brief kip, shower & happy hour. Eventually the “master plan” kicked in & I was headed north to GPS & check out the night spots outside of Rajabhat University. There are also heaps of little student bars & restaurants around the lake, just off campus if you want to take a look. But it’s a “long way” (8kms) from town to ride home if it’s wet & you’re a bit under the weather. It’s also a problem if it rains on the way & you get wet for your date. I didn’t have a date, but a sharp torrential downpour at the airport turn off caught me out & I was a stranded under a roadside awning, wondering if that was going to be it for the night – wet &rained out “stuck” beside the road. 40 mins later the rain let up & off I went. 800 metres up the roads it was bone dry & I got quite a laugh as I slumped into a chair wet, at my target Pub’n Restaurant – The Orange - for the early evening. The Orange’s an open air Pub & Restaurant with music & fine looking staff. I was impressed with the food, service & staff, but not so much the music – even ancient by my standards & too country & western orientated. 1/3 of a bot of Benmores later my wet welcome had worn out & it was back into town. I skipped the So Hub Pub & hit the Mom Khon Muang for a late night & drying out the wet clothes in an air conditioned environment. The Mom Khon Muang really rocks if you like playing chivit & few delinquent teenagers. The MKM is an adult scene & worth checking out. Above: One of my fave views, The Mekong from Tammila ghouse, my fave ghouse in N Thailand. The port in Chiang Khong was as busy as I’ve ever seen it, with the river up & boats both loading & uploading cargo for Thai-Laos-China. But it was the unloading of the Lao corn that got me & I’m glad I’m just a motorcyclist & not a “wharfee,” because they sure do work hard! The Madam Pub in Ck has now closed, see above & that’s a serious disappointment as the Madam Country Pub has always been a bit of a highlight when visiting Chiang Khong. Above: The Way Ahead "clear." R1129 Chiang Khong - Chiang Saen alongside The 'Khong. Above: The Way Behind, "rain." R1129 Chiang Khong - Chiang Saen. Above: The Way Ahead "clear." R1129 Chiang Khong - Chiang Saen through the rice fields. Above: The Way Behind, "rain." R1129 Chiang Khong - Chiang Saen. I think it might have been this rain that hit Mae Sai that night! After CK it was one night in Mae Sai & over to Tachilek for a few CDs & DVDs. Above: The Ruak river in flood. Thailand on the left. Burma on the right. This almost never came off, because of the incessant torrential rain. I arrived in MS at 5.00 pm. Had a shower & sleep. Around 6.30 pm I walked down town to get a newspaper to amuse myself with for an hour, before hitting the town. While at the newspaper shop it started to rain & torrential it was. 1 hr 40 mins later I was still stranded at the newspaper shop when lightened up a little. I sprinted off towards the hotel, when it started again. I reached a Capt Slash approved establishment – 7-11 - & realised how hungry I was, but had no hope of riding to any restaurant dry for a meal. So 7-11 it was for my evening meal – a Magnum ice cream. 2 chocolate bars, a small cake, a bottle of Gatorade. That was the night in Mae Sai! 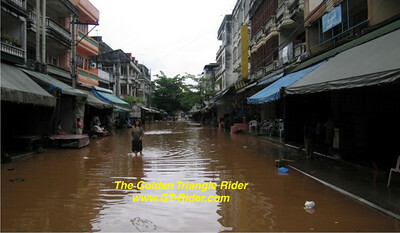 It was no surprise then the next morning to see the market in Tachilek flooded & the riverside road in Mae Sai under water. Check out the photos below….. Above: The Bridge across the Ruak, looking towards Thailand. Normally you ride / drive under this bridge. Above: Tachilek no market this street today. The same day I headed back to Cnx & got away from Mae Sai at 1.00 pm. The weather was dry-ish & as my riding kit was damp I decided to take a chance as ride as far as possible without the raingear to dry out & freshen up a little. 19 kms south of town it came down & I was forced to cover up top & bottom. Not getting the topis alright, but I can tell you that with the wonky left arm getting the pants aint easy. It has to be done sitting down & takes 15-20 minutes fiddling around! This done I hit the wet road only to be riding in the dry 4 kms down the road & all the way into Chiang Mai. Unbelievable, but that’s the way it goes in the tropics. If you don’t out the waterproofs on it rains, & if you do, it doesn’t!